I've been trying to get my new writing craft book, Advanced Plotting, on the market. Yesterday I received the proof copy from CreateSpace. Had it been fine, I could have officially published the book. Unfortunately, I discovered a problem with my line spacing. The bottoms of hanging letters such as g and p were getting cut off. You couldn't tell in the Word document, but you could in the PDF I'd sent to Amazon for printing. I spent several hours reformatting the manuscript. It wasn't a simple matter of just changing the line spacing. I had over 30 sections, each with a different font and line spacing for the heading. If I'd changed the whole document at once, it would have messed up all the headings, plus the title pages. I had to deal with each section separately. As an additional complication, the new line spacing meant each paragraph took up more space. But I didn't want to change the page numbers, because not only did I have the page number set in the table of contents, but within the text I reference different essays by page number. I had to make adjustments to make sure each section started on the same page as before. I'm sharing this as an example of some of the specific challenges you face when publishing on your own. Of course, you can hire somebody to do your interior layout. You may want to do that if you have enough money and don't have a graphic design background. Otherwise, be sure to plan enough time to get the proof copy of your book and study it carefully. Does a Book Need a Hook? An orphan explores his magical powers at a school for wizards. Twins discover they are really genies. Death narrates a World War II story. The young descendants of Sherlock Holmes tackle one of his unsolved cases. A boy discovers a world of monsters, where he has superpowers. Twins deal with pirates, some of them vampires. A hook—in this case the “high concept” idea—can grab the reader’s attention and make a book stand out. Here are the books with the above hooks. Do you need a hook? Well, in today’s competitive market, it sure doesn’t hurt. It’s a quick way to summarize your idea for an editor or agent, handy for writing conferences. So how do you figure out what yours is—or if you have one? On the jacket flap, books often used an “except” or “but” twist. The second part is the twist on a common plot. — A woman thinks her ex-husband is going to try to kill her, but he kidnaps her daughter instead. If your book isn’t trendy, don’t despair. What hooks the reader is individual to that reader. Some may read any book set in a certain time or place, or love talking animals. Don’t try to make your book sound like it fits some hot trend, if it doesn’t. Instead try to hook your readers. Who are your target readers, and what will draw them to this book? A good hook is simple and short—sometimes it’s referred to as a one-sentence synopsis or an elevator pitch (from the idea that you might have 30 seconds in an elevator to grab an editor’s attention). It’s not long-winded, where you are trying to cram everything into one run-on sentence. The hook doesn’t necessarily tell you the plot, but it gives you the flavor of the book and arouses interest. It may be simply the premise. EXERCISE: For practice, name a favorite or recent book—how would you describe it to a friend? Would you pick it up if you heard that description? EXCERCISE: Write a simple synopsis of your work. Don’t worry about length or clarity. Jot down the who, what, when, where and why. Now you have some idea of the most interesting aspects of the work. Time to turn it into a one-sentence synopsis with your hook. To start focusing on your hook, ask, What is the conflict, in terms of X versus Y? Once you have your hook, you can expand upon that one-sentence synopsis for a query letter or longer conversation. On Wednesday I talked about getting into the right mind frame for a writing conference. Armed with the proper attitude, you’re sure to have a good time. Get even more out of the conference by planning ahead. If you're new to the biz, read books to learn the basics—how the publishing industry works, standard submission guidelines, the genres—so you won’t be confused when speakers throw around industry terms. You can also direct your questions better, to take advantage of a particular speaker’s expertise. Next, investigate the conference speakers. Review editors’ submission guidelines and study the books they’ve edited. Read books by the other speakers. Be prepared to offer honest compliments of their work or to ask intelligent questions. Then you won’t go blank when you’re suddenly faced with your idol. The web is a great place to find articles by or about the speakers. You may even find photographs of them. At one conference cocktail party, my friend Cora Goss-Grubbs looked at a man standing by himself and said, “That’s Agent ___.” Because she recognized him from his picture, we got in a nice long chat before anybody else realized who he was. When you meet someone, it’s nice to have an official way to exchange information, so make business cards. I print color business cards on my home computer, with the cover of my novel on one side and contact information on the reverse. Even a simple card with just your name and e-mail is useful. When you exchange cards, jot notes about the giver on the ones you get. You might write something like, “2011 SCBWI LA. 40s, short brown hair. Writing sci-fi for teens.” Then when you get back from the conference with a handful of cards, you’ll find it much easier to remember who gave them to you. You’ve studied the speakers and practiced your synopses. You have a notebook, a pen, and a pocketful of business cards. Arrive early and practice your networking—or friendship—skills. Smile, say hello, and ask a simple question. Take an interest in people. Ask what they write. Offer compliments, ask questions, and listen. When I’m feeling shy and alone, I find someone who looks even more shy and alone. I walk up to them, smile, and say, “How are you enjoying the conference?” They are always delighted to talk. It helps to pair up with a friend for the conference. When we met the agent, Cora told him about my published novel, The Well of Sacrifice. From me it would have been bragging, whereas she just sounded complimentary. At another conference party, I told an editor about my friend Molly’s project. When I introduced her to Molly, the editor asked to see the manuscript. It’s easier to rave about someone else’s work than your own. But be careful not to spend your whole time with just one friend. After all, your goal is to make new connections, so work together to meet people. In honor of the upcoming SCBWI conference in LA, here's an article I wrote for Writer's Digest a few years ago. I'll post the next section on Friday. The big writing conference. Anticipation. Excitement. You’ll dazzle an editor with your book pitch. She’ll beg to see it right away …. You arrive, one among the hordes. Old friends hug and chatter. The display table overflows with attendees’ published books. The conference staff body-guard the editors like Secret Service agents around the President. Anxiety. Insecurity. You are a stray cat among lions. Maybe you shouldn’t have come …. A conference can provide inspiration, camaraderie, and marketing opportunities. Or it can waste your money and shake your confidence. Make sure you make the most of it. Start by changing your attitude. When people hear the word “networking,” most imagine trying to impress bigwigs who could help their career. But many writers don’t feel comfortable selling themselves. If your goal at a conference is to grab an editor and convince her you’re wonderful, you’ll feel anxious. And if you fail to wow—or even meet—the editor, you may feel like a failure. Talk to everyone, from beginners to the pros. You never know who might be fascinating—or helpful in the future. Today’s “nobody” may be tomorrow’s success story, on a first-name basis with top editors and agents. A few years ago, I met a woman who had never published and who had no contacts in the writing world. Two years later, she ran a website organizing online chats between authors and schools. We exchange favors when we have a chance—not because we want something in return, but because we’re friends. My guest today is Dr. Cherrye S. Vasquez, the author of No Tildes on Tuesday. Dr. Vasquez shares how she used educational material along with her fictional story to inspire children and make her book more useful in the classroom. 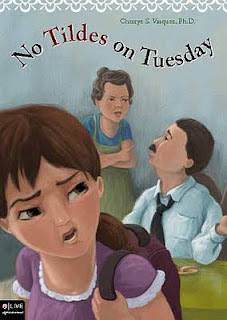 No Tildes on Tuesday is about a girl who doesn't want to learn speak Spanish. But when her parents announce that they are moving the family to a predominantly Mexican-American neighborhood, Isabella grudgingly agrees to start Spanish lessons with her abuela. The passion for writing my first book, No Tildes on Tuesday, stems from a desire to help students/children push forward as they become aware of their personal identities. Although this is indeed a journey, my platform centers around expressing to readers the complexities that may arise in children's lives when they are not introduced and taught to appreciate all of who they are, whether monoracial, biracial or multiracial. My plight is to share the message of teaching children early and often to embrace not only their heritage(s), culture(s) and ethnicit(ies), but the heritage(s), culture(s) and ethnicit(ies) of others including their school mates, neighbors and associates near and far. All being said, even though my book is a children’s chapter book, as a writer, I decided to add a worksheet at the end of it. I’m sure that this idea isn’t unique however; I wanted to add depth to my book so that it would have additional use to teachers in the public school setting. In addition, I am writing a sequel to No Tildes on Tuesday. I hope to title my second book, Dedicated Identity. Since there is a message of identity ownership, I am also writing in a helpful tips page entitled: Positive Approaches in Forming Healthy Identity in Biracial/Multiracial Children. On this page, I will begin with an Introduction followed by tips for parents, educators, and then the biracial/multiracial child. Finally, I have written a message specifically for the child which contains acknowledgement and affirmation statements. By adding these writing features, I hope that my audience will more than likely find greater use for my books. Writers may want to use techniques such as these so that value is added to their books. For example, teachers may not only select my book for classroom reading, but they may want to use questions from my worksheet as they allow students to dialogue among themselves about similarities and differences one to another. Too, teachers can encourage students to journal about their feelings using culturally proficient terminology. By doing so, students can express their feelings through writing. Writing can be a great "medicinal" tool for enhancing and building character, self worth as hearty and powerful individuals who possess strength and empowerment. Once students have read my book, they can begin to have friendly discourse about the main character, Isabella, who happens to be biracial. Students can share how they believe Isabella felt as she journeyed through transitional stages in her life finding and learning about her heritages. Teachers and parents can persuade students to use reflective ideas and thoughts of their own as they share about personal developments in their environments as relative to the story. As writers, using creative ideas such as these can add magnitude to the worth of your books whereby the chances of your books becoming selected are greater. I have previously explored agents' opinions about self-publishing and noted that some are even helping authors to publish independently. One of the big questions in recent weeks has been whether this is a conflict of interest. Some people say yes, because (they claim) the agent is acting like a publisher. My current feelings are that so long as the agent is taking the same 15 percent of income and not charging the author upfront fees, their incentive is to do the best deal for the author, and that's not a conflict of interest. If anything, they might favor traditional publishing because of the quick advance. To take a chance on self-publishing, an agent would have to believe the long-term income would be greater than the advance plus possible royalties of a traditional deal. Plus, many agents are going with a model that has the agency paying for proofreading, layout, and cover art up front, so they risk losing money. It seems like agents will tend to favor traditional publishing deals, especially until independent publishing is proven successful for the majority. If there is a conflict of interest, it's going to be in the direction of favoring the old, familiar model. Of course there is still the potential for abuse with agents helping their authors self-publish. If an agent charges more than their normal 15 percent commission for independently-published work, that could skew the balance so that what is best for the author isn't necessarily best for the agent. Agents could also charge an unreasonable amount for upfront services, even if these come out of initial income. For example, an agency could pay a proofreader $1000, but then charge the book's account $2000, with the extra amount going to pay the agent for the trouble of hiring the proofreader. A good agency will clearly explain what costs they expect to recoup before you start earning money. I imagine the organization that polices literary agents will weigh in on this eventually. As always, understand your contracts, ask questions, and be extra careful with new "agencies" that might spring up to take advantage of desperate authors. I have a guest post at Buried Under Books, where I share some of my writing journey and why I chose to start writing in different genres and for different age groups. A quote: "From a professional standpoint, it might not make sense to change direction just when you’ve gotten really good at what you do. But how can you keep doing something well if it doesn’t interest you anymore? I guess I need to be learning in order to make the experience fun."